Gingerbread houses are really cute, aren’t they – and actually a bit tricky to make, as it turns out! He also had a great suggestion – that rather than just using the kit before Christmas, I make a haunted gingerbread house for Halloween. Of course, that way he gets more gingerbread, but I’m not complaining! The Lakeland kit comes with instructions for making the gingerbread itself which was very easy to do. I was worried the mixture was a bit sticky but once I rolled it out on a floured board it was fine. I cut the front and back of the house out first and they were so large I couldn’t get anything else on the baking tray, so I realised I was going to have to bake the gingerbread in batches. Each piece only spread slightly when it came out of the oven and I used the cutters again after baking but while the gingerbread was still a little soft to cut off the excess again. I was worried that if I didn’t do this, the pieces wouldn’t fit together exactly. As it happened, they still didn’t fit together exactly! I don’t know how I ended up with such big gaps and whether it was down to the baking or the assembly. It held together and looked pretty much OK but there must be a knack to doing it perfectly! Once I had left the house sections to cool, I made up some royal icing using egg whites according to the instructions on the house kit. It said to use 3 egg whites and 500g icing sugar which seemed a lot, so I used two egg whites, and was going to use two thirds of the icing sugar but ended up having to put in nearly another 100g of icing sugar to get it stiff enough. And it meant I had far more icing than I needed, so I suggest – since royal icing goes hard quite quickly – that you use 1 egg and reduce the other ingredients by a third and then make more if you need it. I used a piping bag to apply the icing along the edges of the building sections. The assembly instructions were quite minimal and not that easy to follow – I have no idea how to stick the chimney onto the roof and could have worked it out I’m sure, but decided not to bother with the chimney! First you stick the walls to the cake board – I happened to have a black cake board in the cupboard which was perfect for Halloween – and then put the front and back on the house. Each time you have to leave it to set for about 20 minutes and use a cup or glass to keep the sides propped up. Finally we stuck on the roof – my sister was helping and I do think it’s easier with two people! Once the house was set I added the doors and windows and decided to decorate the roof first. I had a packet of candy corn M&Ms and another of pumpkin spice M&Ms which I’d bought in America. Each packet didn’t quite have enough to cover the whole roof so I did one side one way and the other side another. I think the white, orange and yellow looks more like Thanksgiving colours than Halloween but never mind. I made some ghosts out of giant marshmallows and black food colouring and made a path out the front from more M&Ms. I had some Haribo Halloween sweets which I used to decorate the front of the house – you can’t see too well but they are ghosts, spiders and witches heads. I wasn’t sure that I liked the overall effect but wasn’t sure how else to decorate it – I think this would be good for kids but if you want a more professional look I wouldn’t use the gummy sweets. I have an idea for how to decorate the gingerbread house at Christmas which I think will be smarter so you will have to wait and see! For my first ever gingerbread house I don't think this was bad at all, and it certainly tasted good! 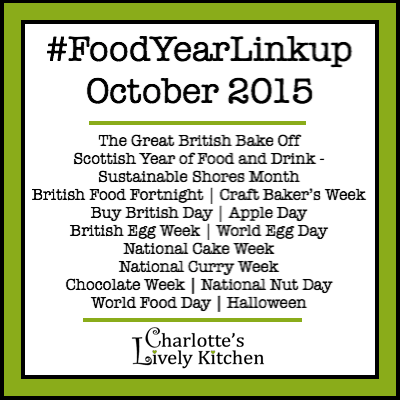 I'm sending this to the Food Year Linkup, hosted by Charlotte's Lively Kitchen, as it's Halloween! that's too cute but i'd never try! How sweet of your fiance to get you those cutters (although it sounds as though he may have had a gingerbread eating ulterior motive :-) ). A great idea to make a halloween haunted house - love it! Love it Caroline! I am a big fan of ginger bread and really enjoy making GF ginger bread houses (I use the same kit as you), but have never thought of doing a Halloween house! Brilliant! All the flavours of Autumn and perfect for sharing!